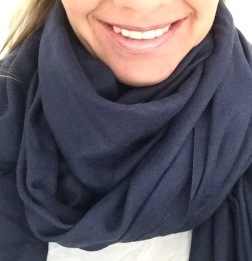 Gorgeous scarfs that is made 70 % cotton and 30 % wool have been arriving to shop. Love the material and size. Just perfect to anyone to use! 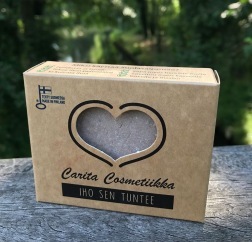 Saltsoaps from Carita Cosmetiikka are lovely handmade soap bars that includes 50% Himalayas salt and 50 % many high class oils plus authentic essential oils. Order now, your skin feels the difference! 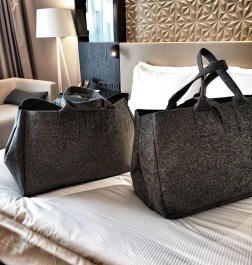 Lovely felt bags are made by 100 % recycled plastic bottles. Material feels and looks like wool felt. So Many great ways to use this bag. 70 litres. 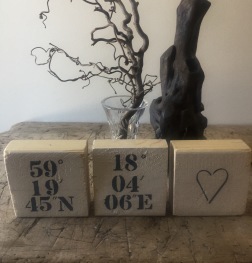 Rustic wooden blocks with white paint in front are available now in shop! Really happy to have those! You can choose your letters/numbers/signs what to have at your blocks. You can also let us know your hometown, homeaddress, birthplace, marriageplace etc and we find out gps coordinates and paint for those. 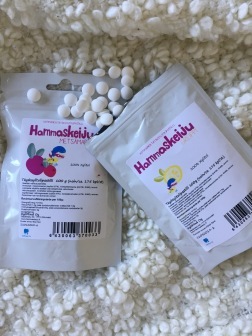 @abritinhelsinki is using Luonnon magiaa products in his vegan foodblog and he is gonna mention at Luonnon magiaa products is sold by minleaf also. 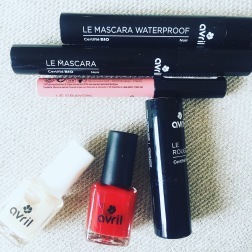 Today we finally have Avril organic cosmetics in webshop. So happy about that! Lovely skincare products. Loving that natural bodyscrub! and some makeup products. Mascara is super good and that BB cream is great! Hope you will try out those all organic products too! 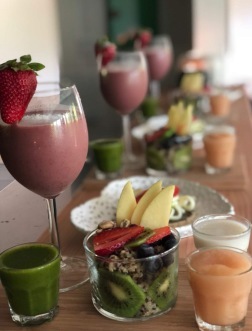 Today visited Yoga Breakfast Club in the morning and had super delicious breakfast there. Will start co-operation with them. 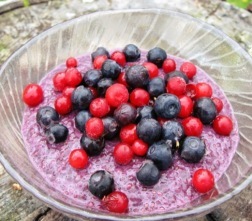 They will start to use berrypowders in mill and frozendryed berries in they breakfast. Super nice place they have in Lidingö. Thanks Reena and Thea! Today arrived more Saaren taika products. 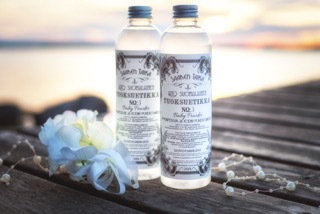 Lot of great feedback for "tvätättika /laundry vinegar" for customers. Its really freshing up your laundry and cleans your washingmachine natural way. Its totally 100% natural and doesn´t harm enviroment at all. It's super great for freshing up also dogs or cats beds.
" tvättättika ersätter vanlig sköljmedel. Den gav mjuk och fräsch tvätt. Som plus på kanten fick jag en fräsch tvättmaskin. Nöjd"
--> "laundry vinegar use as normal softener. It gives soft and fresh laundry. And as extra I got fresh laundrymascine. Pleased." Now xylitols in webshop! 6 different taste. Find you own favorite. Next week will got xylitolpastilles to the webshop. Xylitol is a healthy sugar that has been proven to prevent many oral and respiratory diseases and is even recommended for babies. Xylitol is found naturally in vegetables, fruits and trees. Products containing xylitol are now endorsed by more than 15 dental associations worldwide and xylitol has a European Food Standards Authority approved health claim for plaque reduction. Clinical studies have repeatedly shown dental benefits when regularly consuming products sweetened with xylitol. Now those Arctic Warrior herbshots are in here!! Testpaket includes 2 pc each 3 option. Order now and get your immune and energy in good level!! Next week new products coming to the webshop!!! Arctic Warriors herbshots from Finnish lapland. Really excited about those. Would be good for everyone child to adults. Only natural ingrediens. "Let the arctic power herbs help you through a busy day and stay healthy! A little dose will update your daily food to the next level and strengthen your body in a natural way." 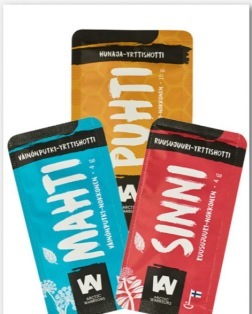 PUHTI gives you natural energy and relief to the sweet tooth. Take with you to work, school, travels or training. Let the arctic power herbs give your day an extra boost! 1. Foam melted butter and sugar. 2. Add eggs one by one. 3. Add flours and bakingpowder and vaniljasugar. 4. Take 1/3 off dough and mix it up with blueberrypowder and milk. 5. Put plain layer to the bakingform and then another layer with blueberry and again plain. Softly mix it with fork that layers mix. 6. 175 C 50 minutes lowest level in owen. 1. mix all to the warm water. Mix it well. 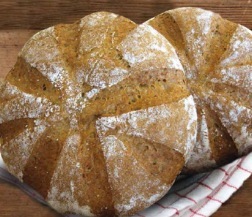 Add flours step by step, that dough doesnt get too hard. 2. Let it take off 15 minutes. 4. Bake 225 C around 20-25 minutes. 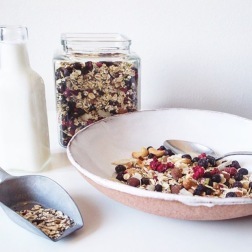 Mix almondmilk, agavesyrap and blueberrypowder well together. Pour mix in cup and mix chiaseeds in. Cover the cup and put in refidgerator at least an hour. Mix it couple of times during that. 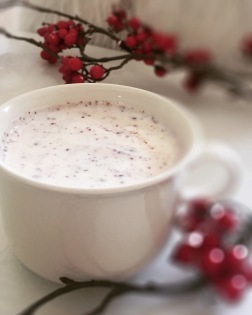 Decorate with berries and enjoy! I was opening my webshop 2 months ago and now wanted to share some details behind that. 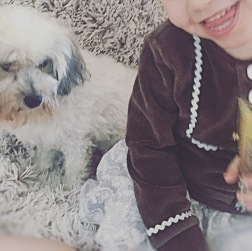 I have family with 3 lovely and beautiful children and gorgeous husband and really cute and funny dog Jack. We are from Finland but have been living abroad as expatlife soon 13 years. And now last 2,5 years in Sweden. Now when I started my import and webshop www.minleaf.se few months ago I wanted to found something healthy snackbars for kids to take with them to school and hobbies and husband to take to office (in boxes that he doesn't need to buy everyday something : )). Found great product from Finland, called Arctic Superfoods. 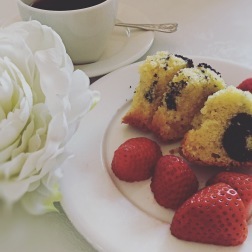 All luxury ingrediens are from Laplands nature and no added sugar and handmade. And the taste is SUPER great! One blueberry bar includes 60 wild blueberrys. And because i didn't found any similar in Sweden, I get idea to import those here and have webshop for those. Recently I have found many another great products to have in webshop. Like frozendryed berry powders in mill from Luonnon magiaa. Super handy and gives taste for your yoghurt, porridge, smoothies, pancakes and ice-cream. And can be used to cooking and baking also. Then I added handmade skincare products from Saaren taika too. Those are cruelty free, only natural ingredienser and no parabens etc added. Like seasaltsoap is including seasalt, sheabutter and some natural oils. Lovely! !